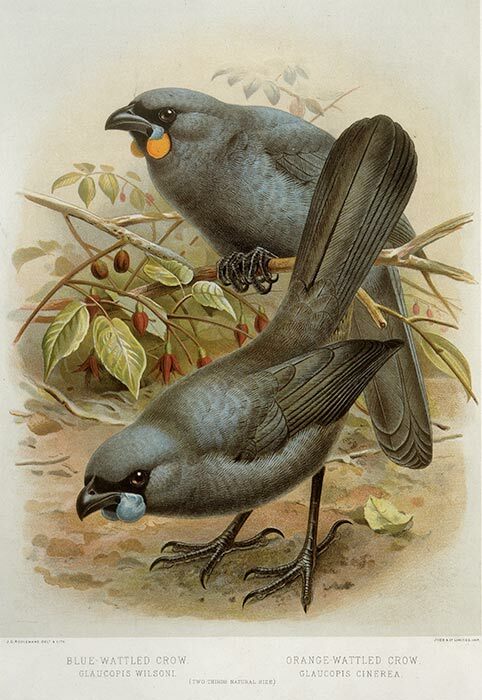 As depicted here by the artist John Gerrard Keulemans, the North Island kōkako (front) has blue wattles at the base of its beak. The wattles of the South Island kōkako (rear) are orange. Both are sleek, blue-grey birds with a black face mask. South Island kōkako numbers dwindled through the 20th century. The only accepted sighting since the 1960s was in 2007, near Reefton. Tantalising reports of their song, feathers, and characteristic moss-grubbing have persisted – from Stewart Island and Fiordland, north to the Kahurangi and Nelson Lakes areas. Some sceptics think that the songs may be from kākā or tūī, which often mimic the calls of other birds. Kōkako songs may have been remembered and repeated within a local population.